Whether conventional press-and-sinter or metal injection molding, PM answers the call of designers faced with difficult, even seemingly impossible, challenges. With the ability to ‘tweak’ materials for specific design objectives, as well as through creative use of machining, PM offers solutions not previously considered feasible. By not accepting the status quo, PM fabricators are altering the part-forming landscape: taking conventional press and-sinter into MIM’s preserve, and vice versa, as well as uncovering new applications in mature product categories. Grand Prize in the Automotive – Engine Category, a MIM bus nozzle used in a selective catalytic reduction (SCR) system of European commercial vehicles. Advanced Materials Technologies Pte Ltd earned the Grand Prize in the Automotive – Engine Category for a MIM bus nozzle used in a selective catalytic reduction (SCR) system of European commercial vehicles. The nozzle performs the SCR function using urea and compressed air to reduce the NOx produced during combustion to N2 and H2O. Made of an austenitic stainless steel (AISI HK30), the part employs a patented technology that uses a removable polymeric insert to form the highly complex internal undercut channel, a feature the fabricator deems ‘impossible’ to achieve using conventional machining. All internal channels are achieved through MIM, while the threads on top are machined and Micro TIG welding is used to seal the small openings left by the polymeric insert; tip flatness is achieved through a grinding operation. It is estimated that fabricating the nozzle through the welding/brazing of multiple parts would have increased its cost by more than 200%. Grand Prize in the Automotive –Transmission Category: a thrust washer and two back-up washers made for its customer Allison Transmission. FMS Corporation was awarded a Grand Prize in the Automotive – Transmission Category for a thrust washer and two back-up washers made for its customer Allison Transmission. The components play a critical role in the function of Allison’s new TC10 automatic transmission for Class 8 (18-wheel) tractors. A first of its kind for the trucking industry, this 10-speed automatic transmission enables even inexperienced drivers to achieve 5% fuel savings over typical manual transmissions, thus contributing to a significant lowering of CO2 emissions. Fabricated of a proprietary low-alloy steel, the three parts are warm compacted to achieve high green density, then vacuum sintered at high temperature, gas-pressure quenched, and tempered. 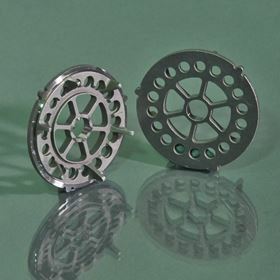 They’re produced very close to net shape, with only precision machining of some surfaces performed to improve the micro-finish as well as for dimensional accuracy. While these washers were an original PM design, they’re estimated to save 30% over the cost of comparable forged/machined components. Grand Prize in the Automotive – Chassis Category: a rake cam, right-hand and left-hand guides, and an eccentric cam made for its customer Nexteer Automotive. Keystone Powdered Metal Company received the Grand Prize in the Automotive – Chassis Category for a rake cam, right-hand and left-hand guides, and an eccentric cam made for its customer Nexteer Automotive. The diffusion-alloyed steel components are used in Cadillac ATS and CTS, Chevrolet Impala, and GM Holden Commodore (Australia) steering columns. They’re key elements of the column’s tilt and telescope adjustment feature, serving a vital role in maintaining the column’s position during a crash event. The multi-level parts are fabricated to net shape, with in-line heat treatment and tempering being the only secondary operation preformed to insure the required hardness and strength. The rake cam and guides have features that allow for a mechanical lock of the plastic overmold, in an operation performed by Agapé Plastics, Inc. The economic targets of the customer’s preferred design for the steering column tilt/telescope adjustment and lock – with a ‘pin pocket’ that gives a positive detent feel – could be met only with the flexibility offered by PM. Four MIM components: catcher, tension bar, and new base cap & body – earned the Grand Prize in the Lawn & Garden/Off-Highway Category. 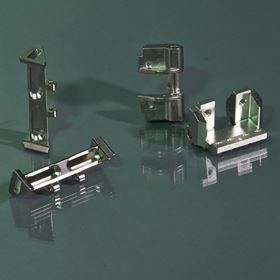 Four MIM components made by Indo-US MIM Tec Pvt. Ltd, Bangalore, India – catcher, tension bar, and new base cap & body – earned the Grand Prize in the Lawn & Garden/Off-Highway Category. The components, made for Danfoss, Denmark, are used in proportional valves found in hydraulic circuits of off-highway and farm equipment. The two parts forming the new base are made of MIM 17-4 PH stainless steel, while the catcher and tension bar are formed of 4605 lowalloy steel. All dimensions of the two parts forming the new base are achieved in the as-MIM condition, including the internal thread in the body. The catcher receives a grinding and burnishing to attain the OD tolerance and surface finish, while the tension bar needs only a turning operation to form an external thread without a parting line. 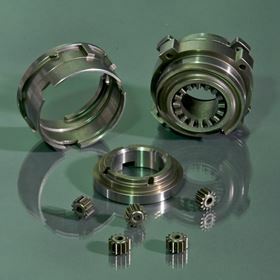 The parts were formerly produced via machining, welding, conventional PM, and fastening. By completely re-designing the parts to maximize the advantages MIM offers, the customer obtained savings estimated at 65%, with annual production of 350,000. TheGrand Prize in the Hardware/Appliances Category: five conventional-PM components assembled in a planetary gearset. 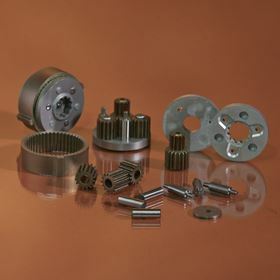 Allied Sinterings, Inc received the Grand Prize in the Hardware/Appliances Category for five conventional-PM components that are assembled in a planetary gearset. The parts – input flange, output flange, planet gear, sun gear, and ring gear – go into a self-contained single-stage gearset used in high-end lighting-control applications. The input and output flanges are made of nickel steel, the planet and sun gears of a low-alloy hybrid steel, and the ring gear of a sinter-hardened steel. The assembly is completed using a washer, spacers, and dowel pins, easily producible or off-the-shelf items whose use was a specific objective of the gearset design. Both flanges are produced net shape, requiring no secondary operations. The sun gear is actually designed as a compound gear, with the second gear serving as a spline for the mandrel. It and the planet gears are heat treated to increase their strength. The lower hardness requirement on the ring gear allows it to be made of a sinterhardened powder. Tight tolerancing is essential for the gearset’s virtually noiseless operation. The Grand Prize in the Hand Tools/Recreation Category: a breech block made for Smith & Wesson. Advanced Forming Technology, an ARCMIM Company, was awarded the Grand Prize in the Hand Tools/Recreation Category for a breech block made for Smith & Wesson. Fabricated via MIM from 4605 low-alloy steel, the block is inserted into the slide body of a .22 caliber pistol, creating the breech face and other critical functions. The unique geometry of the part – composed of two large masses separated by a channel running axially down the length of the part, creating two distinct bodies connected by very small ribs – presented a significant challenge to keeping the part together during sintering and maintaining tight final tolerances. 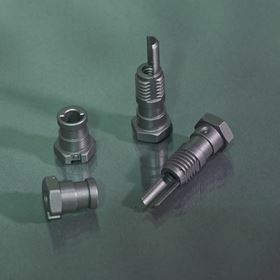 The component was manufactured 100% to print with no secondary machining operations; it is heat treated to a hardness range of 37–45 HRC, receives a black oxide finish, and then undergoes a coining operation to qualify the width. 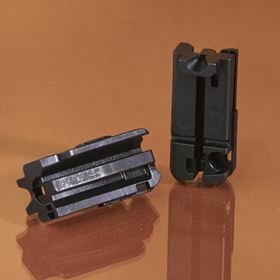 The fabricator believes this is the first breech block fabricated using MIM, an indication that it is possible to expand the application boundaries for MIM even in a mature arena such as firearms. A sinter-hardened steel planetary gear system, featuring a carrier with an integrated sun gear and three planetary gears, earned the Grand Prize in the Medical/Dental Category. A sinter-hardened steel planetary gear system, featuring a carrier with an integrated sun gear and three planetary gears, earned the Grand Prize in the Medical/Dental Category for ASCO Sintering Co. The system is used in multiple stacks for gear reduction in a single-use, portable, physician-operated surgical device. 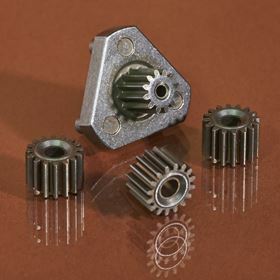 In addition to the integrated pinion gear, the carrier includes three posts that extend above the flange with a 2-to-1 length-todiameter ratio. Proprietary press mechanisms were required to achieve the post density, as well as a proper post-to-flange bond. The carrier is pressed, sintered, and tempered to net shape. The part had originally been fabricated as an assembly of a PM part and wrought posts. By integrating the posts to the flange through advanced PM manufacturing techniques, and by the elimination of a secondary heat-treating operation through the use of modern sinter-hardening materials, the new part design achieved a 60% cost reduction. 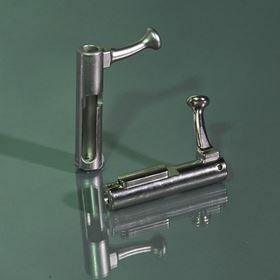 The part is an outstanding example of a PM medical application, unique in that it is not made of stainless steel nor fabricated through MIM. 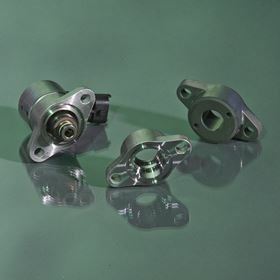 The Award of Distinction in the Automotive – Engine Category: a stainless steel flange made for Kendrion FAS Controls. SMC Powder Metallurgy Inc won the Award of Distinction in the Automotive – Engine Category for a stainless steel flange made for Kendrion FAS Controls. The component connects and seals a spill valve operating in an automotive fuel system. The valve was specially designed for gasoline direct injection technology, facilitating lower fuel consumption and higher efficiency. Replacing a wrought part that required heavy machining, the PM flange is fabricated from a proprietary premix developed in order to achieve the required dimensional stability. The part has a perpendicularity requirement relating to the machined counterbores and O-ring groove. After compaction, the parts are de-lubed and then placed on specially designed slates for high-temperature sintering in 100% hydrogen. The parts are then resin impregnated to aid in machining and for a mechanical seal. The customer believes this is the only PM part used in a high-pressure fuel system, and it is expected to expand into other platforms. To date, over 1.6 million flanges have been made and shipped to the customer. The Award of Distinction in the Automotive – Chassis Category: a MIM 4605 low-alloy steel top plate made for Multimatic Inmet, Canada. Indo-US MIM Tec Pvt. Ltd received the Award of Distinction in the Automotive – Chassis Category for a MIM 4605 low-alloy steel top plate made for Multimatic Inmet, Canada. The part goes into shock absorbers of Chevrolet Camaro automobiles. The complexity of the part – with its 18 holes and six thin ribs that connect to a ring around a central hole – presented a challenge to complete filling. The gating and venting system played a key role in producing this part defect free. It is produced close to net shape, with surface grinding to achieve flatness and a facing operation to achieve height tolerance being the only secondary operations performed. This application is a new design for MIM and delivers increased repeatability/accuracy of the shock absorber over the previous machined version, with estimated savings of 25%. The Award of Distinction in the Hardware/Appliances Category: two MIM 17-4 PH stainless steel parts – front and rear keepers that go into industrial electrical locks – made for Rutherford Controls Inc. The company also received the Award of Distinction in the Hardware/Appliances Category for two MIM 17-4 PH stainless steel parts – front and rear keepers that go into industrial electrical locks – made for Rutherford Controls Inc. The parts’ complexity, with many cross holes and sharp knurl features, required the use of multiple slides, some moving at different angles. The parts are made close to net shape requiring only a final coining to adjust a small distortion and a tapping operation on the front keeper. Annual quantities are 20,000 per part. Award of Distinction in the Hand Tools/Recreation Category: a 4605 low-alloy steel bolt used in the Crickett 22LR rifle made by Keystone Sporting Arms, LLC. Indo-US MIM also received an Award of Distinction in the Hand Tools/Recreation Category for a 4605 low-alloy steel bolt used in the Crickett 22LR rifle made by Keystone Sporting Arms, LLC. Made via MIM, the part replaced one produced by brazing together three machined parts, delivering an estimated 35% cost savings in the process. 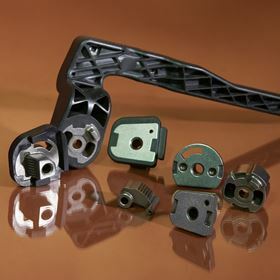 The part’s design features many cross holes and undercuts, requiring complex side core matchings in the molding cavity. The fabricator delivers 60,000 pieces annually. Award of Distinction in the Electronic/Electrical Category: a MIM 17-4 PH stainless steel shell made for Hirose Korea Co. Ltd.
Another Award of Distinction in the Electronic/Electrical Category for two parts – a male fool-proof device and a female polarizer – made for Amphenol Air LB France. Finally, it received two Awards of Distinction in the Electronic/Electrical Category. The first award was given for a MIM 17-4 PH stainless steel shell made for Hirose Korea Co. Ltd. The part goes into a charging assembly for mobile phones. 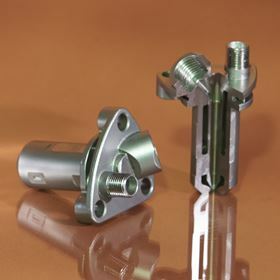 The complex geometry of the part, with thin cross sections and internal undercuts, was achieved with a slide-in-slide mechanism moving on specially designed cam tracks. The MIM part replaced an earlier design that used sheet metal processing and welding, with an estimated 20% cost savings. Two million of the parts are delivered each month. Award of Distinction in the Hand Tools/Recreation Category: five components comprising an output gearbox that serves as feedback for an anti-twist lock on a drill driver. The second Award of Distinction in the Electronic/Electrical Category earned by Indo-US MIM was for two parts – a male fool-proof device and a female polarizer – made for Amphenol Air LB France. 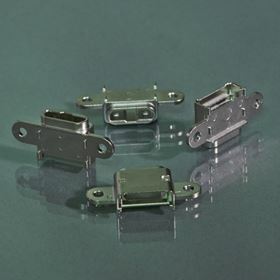 Made via MIM from 4340 low-alloy steel, the parts go into an electric connector assembly made for Airbus. Both parts are fabricated to net shape, with all dimensions achieved in the as-MIM condition; this includes the threads, which are formed through auto unwinding in the tooling. The fabricator delivers 320,000 pieces annually. Porite Taiwan Co Ltd earned an Award of Distinction in the Hand Tools/Recreation Category for five components comprising an output gearbox that serves as feedback for an anti-twist lock on a drill driver. 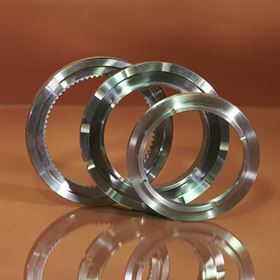 The parts – intermediate flange, anti-twist lock, mount ring, centering sleeve, and planet gears – are made from diffusion-alloyed steel. The flange is compacted using two upper and two lower punches, and powder moving technology is employed to achieve a more uniform density distribution. Tight tolerances at the inner and outer diameters is accomplished through machining, and a milling operation provides the holes needed for part assembly. The parts’ design, with extremely thin sections and highly complicated geometries, required precise control by a CNC compacting press. The PM design saved more than 40% over the cost of manufacturing through forging and machining. This story is reprinted from material from MPIF, with editorial changes made by Materials Today. The views expressed in this article do not necessarily represent those of Elsevier. The MPIF has posted pictures of the metal parts submitted to its Powder Metallurgy Design Excellence Awards competition.